Pick your favourite property expert and check out their advice regarding the benefits of claiming depreciation on their investment properties. 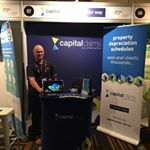 Whether you follow Margaret Lomas or Michael Yardney, or you prefer Cam McLellan, or Jane Slack-Smith, whether you're a cash-flow positive only investor, or a negatively geared investor waiting for capital growth, experts are clear on the benefits of claiming for depreciation on investment properties old and new. Claiming for depreciation improves cash flow and brings with it the opportunity to pay down debt or reinvest and grow your portfolio. This is a key part of the strategy employed by experts around the country who continue to build their portfolio and their wealth year after year. Depreciation is simply a tax deduction, claimable by investors to account for the ageing and wearing out of their investment property and it's assets over time. In the same way you can claim for interest paid on your investment loan, repairs and maintenance expenses, property management fees and insurances, you can also claim for depreciation of your investment property. 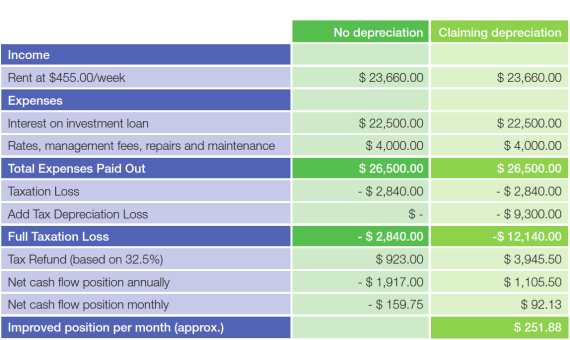 Depreciation is claimable under 2 types of ATO allowances - Division 43 Capital Works and Division 40 Plant and Equipment. Note: unless your property is brand new, if you purchased your property after May 9, 2017 you may not be eligible to claim depreciation on the Plant and Equipment you acquired - you can read more about why here. One of the great things about depreciation is that unlike other expenses you claim, where you pay money for something and then claim it back in your tax return, depreciation is a "written down" or calculated deduction. This means you just use the figure reported in your depreciation schedule each year and include it as an expense in your tax return. Understanding the impact of depreciation on cash flow is particularly useful when assessing the feasibility, or affordability, of an investment property. Investors need to know how it is going to affect their back pocket every week. In the following example, where no depreciation is claimed, the cash-flow position of the property is negative $159.75 per month, or $1,917.00 per annum. 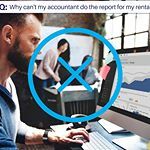 This means the investor has to find $159.75 per month to make up the shortfall between the income generated by the investment property and the expenses incurred. By claiming depreciation in this year, calculated to be a total tax deduction of $9,300, the post-tax cash flow of the property becomes positive $92.13 per month, or $1,105.56 per annum. Remember, this is post-tax, meaning the investor has an extra $251.88 cash, every month. Or, if the investor is simply claiming the deduction at tax time, this is a $9,300 deduction that can reduce tax payable for the year by $3,000 to $4,000 (depending on your tax bracket). The above example is for a house purchased before May 9, 2017 and so includes depreciation for both Division 40 and Division 43. For Division 43 Capital Works annual depreciation is calculated as 2.5% of the total construction cost (excluding plant and equipment assets). If you do not know the construction cost of your property a Quantity Surveyor is qualified to estimate that for you. Learn more about Division 43 here. Division 40 Plant and Equipment assets are depreciated using one of two methods: diminishing value or prime cost. Each asset must be individually costed or valued and depreciated according to it's effective life as determined by the ATO or as adjusted by a Quantity Surveyor. discuss the results with your accountant or the ATO as required.
" ...around half of property investors don't claim depreciation! Seriously; I couldn't believe it either. Get a depreciation schedule and ensure you claim every cent." - Cam McClellan, My four-year-old the property investor. 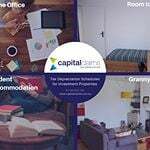 What is Division 43 Capital Works? Can I back-claim for depreciation? If you are not claiming depreciation for your investment property you are most likely over-paying your tax by thousands of dollars every year! To find out how much you could be claiming, contact our team for a free estimate of deductions using the link below or contact our team on 1300 922 220. What is Division 43 or Capital Works? BMT Tax Depreciation is not your only option!